Panthic Morcha, an organisation of over two dozen social and religious organisations of Sikhs, Sunday said it would not contest the upcoming Lok Sabha elections and will support the Congress to strengthen “secular ideology” in the state. On March 18, the Morcha had announced prominent Sikh leader Avtar Singh Khalsa as its candidate from Jammu-Poonch parliamentary constituency, which is going to polls in the first phase on April 11. 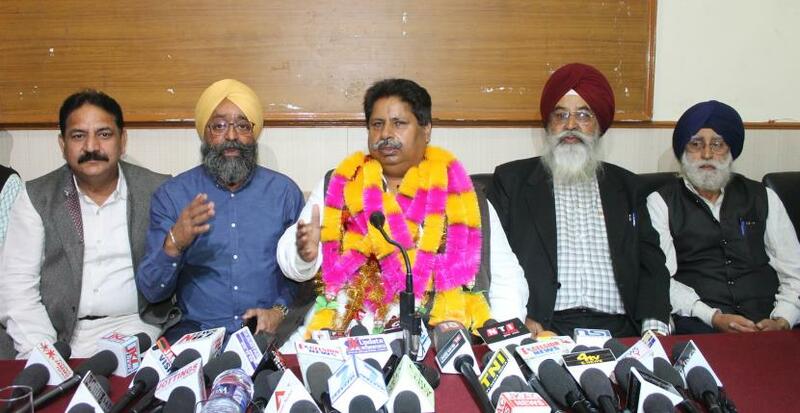 The Congress has fielded former minister Raman Bhalla from the constituency and enjoys support form the National Conference, which has sealed a pre-poll alliance with the party. The PDP had also decided against fielding any candidate from the two seats of Jammu and Udhampur to ensure that votes are not divided. “After meeting Congress state president G A Mir and other senior leaders, the core group of Panthic Morcha decided not to contest the elections and instead the community will vote for Congress candidate Raman Bhalla to ensure the win of the secular ideology,” Khalsa told reporters here. Khalsa, who was flanked by Bhalla and other prominent Sikh leaders, said Mir assured the community that all their genuine demands would be addressed to their satisfaction. He welcomed the decision of the PDP president and former chief minister Mehbooba Mufti not to field candidates in Jammu and Udhampur parliamentary constituencies and said the need of the hour is to stand united against those bent upon to dividing the people. “The minorities are feeling insecure in the prevailing atmosphere in the country. How can I sleep when my neighbour’s house is in flames? We have to come together to safeguard our country for which all the communities have made numerous sacrifices,” Khalsa said. He alleged that the Sikh community faced discrimination and neglect in social, economical and religious matters since 1947 and had decided to field own candidate to raise the voice of the community at the appropriate forums. “Given the communal divide and the challenges before the country, we have come to the conclusion that the need of the hour is to stand united against the divisive forces to defeat them,” he said. The Jammu parliamentary constituency is spread over four districts of Jammu, Poonch, Rajouri and Samba, covering a total 20 assembly constituencies. Jugal Kishore of the BJP is seeking re-election from the constituency after wresting the seat form the Congress in 2014 general elections, winning by a margin of over 2.57 lakh votes. Bhalla thanked the Panthic Morcha for the support and said he would work to ensure the “fascist forces” are uprooted and people live in peace and communal harmony. In response to a question about PDP’s decision not to field candidates from Jammu and Udhampur seats, he said, “We are thankful to all those who are coming forward and extending support to strengthen secular ideology. In response to another question about the charge that the Congress settled Rohingyas in Jammu, Bhalla said they were settled during the NDA rule between 1996 to 2002. “Union Home Minister Rajnath Singh termed them as a security threat to the country but why they did nothing in the past five years to send them back to their country?” he said. The Congress leader said the BJP stands “exposed before the public as all its promises like development for all, plot of land for the border residents, compensation to Pakistan-occupied Kashmir and Pakistani refugees have fallen flat”. Bhalla said he will seek votes for overall development, to address the growing challenge of providing employment and maintaining communal harmony and peace in the state.